This is a pan on a mission - to bake the best lasagna. 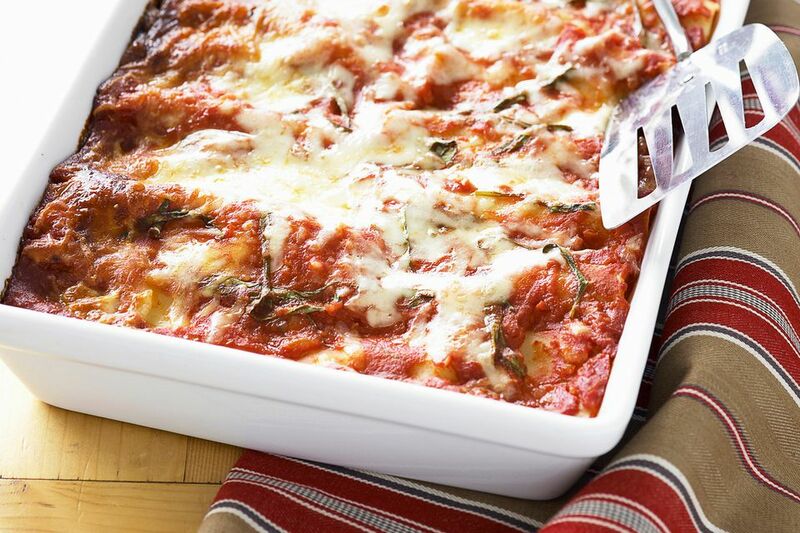 User-friendly and optimum performance truly makes it the best lasagna pan out there. No kidding. The 'maze' design allows great heat distribution to every 'row', noodles stay stacked during cooking/serving and the pan construction is the best for optimum baking results. For beautiful presentation in square form, this cermaic pan that comes in ten colors looks just as good out of the oven as it does presented at the dinner table. It has a lead-free glaze and besides being oven safe can also go in the microwave when you want to heat up leftovers quickly. The dimensions of the inside of this are 9" making it the perfect size for a family of four with room for some leftovers. An economical and classic bakeware that though it's not as deep as those above, it will never go out of style or use. This Pyrex® baking dish is easy to clean and is dishwasher, microwave, freezer and also oven safe to 400 degrees. But what is a very nice feature with this Pyrex bakeware, it has wider handles for safer handling. A good lasagna dish and bakeware that you'll use for so much more than lasagna. 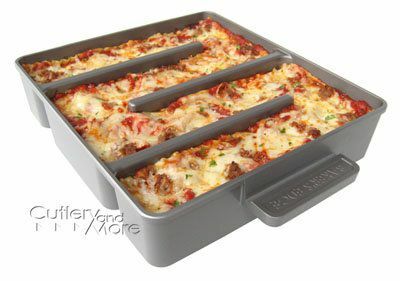 Bakeware suitable for lasagna and other baking essentials. Anchor Hocking has a great selection of bakeware available in full sets or single items. So does Pyrex. Either of these brands have been kitchen essentials for decades. Their versatile rectangular and square baking dishes are very suited to lasagna dishes, are economical and easy to clean. Some of their bakeware items also come with lids making them easy to carry to socials or to freeze meals for future serving. Glass bakeware is also an ideal choice for non-baked desserts and squares, as well as meals, but you do need to be careful with this type of bakeware. This gleaming KitchenAid roaster is made of two layers of stainless steel for excellent heat conduction, easy cleaning, and beautiful serving. It will look stunning in any kitchen. This is an ideal lasagna pan and would also be a great roaster for a turkey. The contoured stainless steel handles make it easy to grip, and the non-stick coating is PTFE & PFOA free. Since this roasting pan is ideal for a turkey or large chicken (as well as lasagna), learn what poultry tools are a must. A wide and shallow roaster made of cast iron for quick, even cooking with a durable easy-to-clean finish that will not discolor. This elegant yet practical 10.25" x 15.75" roaster can also be used for stove-top frying and is a nice size for various large meat and poultry roasting. This is easy care cast iron, with no curing or special care needed. Lasagna dishes in beautiful colors, each with a cream interior and different sizes, comfortable handles and they are oven, broiler, freezer, microwave and dishwasher safe. These oven dishes are resistant to extreme temperature changes making them ideal for freezer to oven use and they have a great depth for layers of lasagna. A practical and economical CorningWare® baking dish is handy for taking to a pot-luck dinner. These particular baking dishes are quite stylish making them beautiful for oven-to-table serving.